In the past couple of weeks I have seen many of the major art museums in this great city, including the Louvre, the Musee d’Orsay, the Picasso Museum, the Rodin Museum, and the Matisse exhibit at the Senat, all of them with Renee. The Louvre is a very big place. Renee and I were in there for close to five hours, which is probably a personal attention span record. I’m usually a very fast-paced museum goer. We saw a lot of old stuff — obviously the big three (Venus de Milo, Winged Victory, Mona Lisa in her new special display room, plus Antonio Canova’s Cupid and Psyche, ancient Egyptian artifacts, ancient frescoes, ancient mosaics, ancient statuary, ancient Napoleonic apartments, lots of other ancient stuff, and one of my personal favorites, the French Crown Jewels. I last saw them in July 1995 when I was doing the youth hostel / backpack thing for six weeks with my cousin, Mario. We came across them by fortuitous accident; but this time I sought them out deliberately. I think the British have done a much better job of displaying their Crown Jewels with people movers that get people in and out in an orderly fashion and give everyone an equal chance to see. At both the Crown Jewels and the Mona Lisa people form rings around the object and it’s not clear when it’s your turn or why the person behind you is pushing. I wish I had been able to see some of the goodies better. And I certainly need to read some more French history. Who are all of these people? I know a lot more about the British royal succession, perhaps because it’s more orderly and tidy than the French. Fewer revolutions. I did get to be closer and spend more time in front of the Mona Lisa than I ever had before. And I asked myself again, what’s the big deal? I think it’s beautiful and superbly executed and mysterious and all that; but what’s all the mystique about? The enormous painting on the wall across the room from Mona, The Wedding Feast at Cana, is a monumental and massive work. Why isn’t it famous? Is Mona our oldest celebrity? More photographed than Diana, Princess of Wales? My real love is 20th century art (and is likely to become 21st century art), but I can see and appreciate the long foundation underneath the things I love. I’d still rather have a Van Gogh than the Mona Lisa any day. I’m making my fantasy list of paintings I’d love to live with, and Mona isn’t on it. The Louvre has done a masterful job on their website. Their collection is so vast. They’ve provided an incredible level of detail and access to information. Kudos to the people who did this monumental work. Renee and I also spent quite a long time in the Musee d’Orsay, which is a beautiful building housing a large swath of French painting as well as sculptures and decorative arts. It’s the place to go to see art after 1848. The Rodin Museum is also housed in a beautiful building. It’s great to see The Thinker and The Kiss, but my favorite part of this exhibit was seeing what art Rodin collected for himself, especially the Van Gogh paintings that he owned. I saw a painting I’d never seen before, even as a reproduction, that I just love. It’s called Portrait of Père Tanguy and has an homage to Japanese woodblock works in the background. I could spend hours with this painting. I also got to see a great Matisse exhibit of his late work, called A Second Life. This show had several of his monumental cutouts, and the Jazz Series, as well as many of his late paintings. This exhibit was quite crowded, and I gave up on the claustrophobic gift shop after being bumped around. I’ll buy the exhibition catalog from my friend Jenny’s bookstore. Matisse is one of my favorite artists. And surprisingly, the Musee Picasso is housed in a beautiful building in the Marais near the Place des Vosges. They had a fantastic exhibit of Francis Bacon’s work juxtaposed with Picasso. There were several enormous Bacon works on loan from the Tate Modern in London, which has a great website of its own. I’ll need to buy this exhibition catalog from Jenny’s bookstore, too. During my six week experiment with city living, I’ve really tried to take advantage of the things that Paris has to offer. The art museums are certainly an incredible part of this city. I had the chance to explore another one of the restaurants in the Guy Savoy food empire last night. Les Bouquinistes is located on the Left Bank just across the street from the Seine at the Pont Neuf bridge and Notre Dame cathedral. I’ve been lucky to get to spend time with Greg Reinacker and Anita Taylor from Newsgator the past couple of days, and we’re having a blast getting to know each other. Dinner together was (another) great conversation about quantum mechanics and entrepreneurial company growth patterns and shoes, with some very nice food thrown in for good measure. The atmosphere at Les Bouquinistes feels very California to me. It’s probably some big blasphemy in the food world to compare Paris to California, but I call it like I see it — and I saw bright, cheerful colors and contemporary art and fresh food with sophisticated flavors that I associate with dining in San Francisco. I had an appetizer of risotto with prawns (confirmed first that it was prepared without wine) and shared bites of Greg’s swordfish and salmon carpaccio. For my entree I had tuna three ways: seared, tartare, and in phyllo, served with a side dish of basmati and wild rice with herbs. The tuna was excellent and each preparation was distinct from and also complementary to the others. The seared tuna had capers and caraway seeds and a tart, acidic finish and was my favorite of the preparations. The tartare was good, but my favorite tartare is still at Aqua. Dessert was hard to choose, with lots of fruit options. I finally went with the trio of creme brulees. They were served in oval shaped glass glasses instead of the traditional ramekin. The flavors were fruit, nougat and pistachio, with perfectly crisp tops. Very nicely done. I’d eat here every week. So I’m probably the last person to discover Wikipedia, but now I’m a true believer. I was just having trouble with the official site for the Musee d’Orsay here in Paris while working on my Museums of Paris blog and clicked on the Wikipedia listing for my first experience with this amazing place. I may never leave this site. Reading, reading, reading. There are two major incongruities in Atlas Shrugged for me. The first one is the use of the cigarette as a symbol of man’s mastery over the element of fire. (See p. 65 for relevant quote) It’s an anachronism. The copyright on the book is 1957. Given what we know today about the actual effects of cigarette smoking that weren’t widely known then, I don’t think this language would be used if the book were to be written today. Leaving room to acknowledge that better information is likely to come along (where is my teleporter machine?) is a core value of this philosophy. During the confrontational scene in Dagny’s apartment between Francisco and Rearden, Francisco says, “Within the extent of your knowledge, you are right.” (p. 599) And really, that’s all that’s possible for any of us in our thinking. The other thing that always jars me is that I have never wished to see a billboard while driving or hiking or living in the mountains. Never. When Dagny and Rearden are taking their first vacation together during which they find the remnant of the motor there is the following exchange. “What I’d like to see,” said Rearden, “is a billboard.” (p. 266) and then on the next page Dagny says, “…think how often we’ve heard people complain that billboards ruin the appearance of the countryside….They’re the people I hate.” (p. 267) When I sit on my patio and look down Eldorado Canyon, I don’t think, “Oh, I’d love to see a copper smelter right there and some open pit mining right there next to it.” Never. I’m not going to go to French school any more. I’ve decided that since I’m only in Paris for another ten days, I’m going to kick off my goody two shoes and run around freely. The bloom is off the grammar rose. I have worked very diligently and done hours and hours of homework and been a good, gold-star seeking student, and now it’s time to play. It’s (finally!) sunny and springtime here, and I’m going to live it up. Maybe I’ll do something really wild like buy myself a book in English that I can read, just for fun. Lespinasse in the St. Regis Hotel in New York, which no longer seems to exist? Does anybody have current information? I just spent an inordinate amount of time trolling around the internet and could find old articles from 1991 about the restaurant, but the hotel’s website doesn’t contain anything about Lespinasse. This was my very first degustation menu, and a vegetarian degustation at that. Forever memorable. Restaurant opinions are very personal, of course. As they say here: Chacun a son goût. I’ve been fortunate enough to experience meals at so many superb restaurants, several of them on this Top 50 List. My two Top Ten Paris restaurant experiences at Le Cinq and Restaurant Guy Savoy had plenty of similarities, all of them wonderful. The food was exquisite: delicate, fresh, beautiful, aromatic, unique, full of adjectives. At both places the staff is clearly delighted to be doing what they’re doing, and proud to share their knowledge and the evening in high good spirits. There was not a single second of feeling awkward about being an American or not really speaking French. Both evenings were lengthy, and I never noticed time passing. Zen gourmet. I think I’d have to say that the major difference between the two evenings, which may make Le Cinq slightly more memorable in the long term, is that I forgot to tell the incredible staff there that I’m seriously allergic to wine, and something was prepared with that vile substance, and by the time we got home after the meal, I was sick as a dog. I thought I might be sick in the back of the taxi or in the street. Yippee. Later that day (since I was up until well after 2:00, procrastinating as hard as possible the inevitable vomiting process, and then puking my guts out), while waiting to feel like a human being again, reading the menu more closely, it very clearly states, “Salade de morilles a l’araignee de mer at AU VIN JAUNE” which in English means Morel Mushroom Salad with Spider Crab and YELLOW WINE, YOU ILLITERATE, PRETENDER TO BE SPEAKING THE FRENCH, SEVERELY ALLERGIC TO THE WINE PERSON.” Of course, the reason I was able to lazily peruse the menu was that when Brad asked for a copy of the menu during our dinner, meaning a single quick photocopy, the restaurant prepared individual copies of our own particular degustation menu for the evening for each member of our party. That’s a new level of service for me. The other thing that was unique in my experience was the positioning of a small padded stool near my chair to serve as the home for my purse. My purse usually hides quietly under my chair; it doesn’t get its own comfortable seat near the table. Now it expects that kind of treatment at home. I really insist that the fact that I’m unable to read and am allergic to wine is completely separate from the elegance and seamless luxury of the experience of dining at Le Cinq. It’s not their fault that I ate a poison. I was much smarter by the time Renee and I got to Restaurant Guy Savoy last week, and the first thing I said after “Bon soir,” was “Je suis allergique du vin. J’ai une allergie du vin. Je ne boire jamais du vin.” Of course, since all of the staff speak beautiful English, I needn’t have bothered, but I’m going to get in the habit of announcing my allergy at the beginning of every restaurant meal so that I never have to have the retching through the night experience again. The differences between the experiences are more about the atmosphere than about the food. When a course is delivered at Le Cinq it’s almost as if there’s a flourish of trumpets. The room is grand and exquisitely French and makes one feel like Marie Antoinette (before the beheading, of course). Guy Savoy feels like you’re dining at a friend’s home; a friend who really knows how to cook! The space is small and intimate, divided into multiple alcoves and rooms, fairly dark with pools of light along the walls highlighting the contemporary artworks. There were a total of four tables in our room. There are sight lines into other rooms so that you glimpse other diners, but feel as though you’re having a very private and special experience. A new dining experience for me at Guy Savoy was individual pairings of bread with each course. The bread cart is rolled out and a staff member describes the different options and makes a recommendation to complement your particular food choice. It’s a great idea, and once you’ve heard it, seems obvious. The flavors of the bread are an important part of the degustatory experience, and they wouldn’t want you to inadvertently choose a bread whose flavors would overwhelm the delicacy of a course, or a bread that wouldn’t hold up to something very flavorful. The most memorable bread has little spikes along both sides and looks like some kind of sea creature and is called Mustache Bread. The staff is always only making a helpful suggestions to enhance your experience; never any hint of snobbery. “We recommend this, but if you prefer something else, we’re happy to accommodate you,” is the tenor of the entire evening. Incredibly elegant and intimate. After some course midway through the evening, I guessed that it was 9:15 and when I looked at my watch it was 10:30. My recollection of my food choices for the evening don’t include the various amuse bouche and extra dessert goodies that magically appear. I do remember that we had small little delicacies like a raisin wrapped in crispy mille feuille still warm from the oven. The first amuse bouche was a foie gras something, so after I said that I don’t eat meat, they brought me tiny carrots and sugar snap pea pods on a tiny skewer with a citrus sauce of some kind. I started with the Soupe d’artichaut a la truffe noire, brioche feuilletee aux champignons et truffes (creamy artichoke soup with black truffles and a flaky brioche roll with mushroom and truffle butter) and then had an appetizer portion of seared tuna with various scents in a ginger cream sauce, followed by some morel mushrooms with tiny asparagus and then the entree of Breton lobster roasted in its shell, with Bordelaise sauce and tiny coral beads decorating the plate. This dish made me wish I had a camera. Perfectly arranged, colorful, and presented like a jewel, with bright citrus flavors in the sauce. Just beautiful. I love a nicely presented lobster. I still remember the first whole lobster claw I ever had, at Jasper White’s in Boston, another restaurant that I think doesn’t exist anymore, or at least not in its Atlantic Avenue incarnation. (Jasper White’s Summer Shack restaurant) The lobster at Guy Savoy was perfection. I think it was finally time for dessert, although it seems possible that I’m omitting a course in here somewhere. I couldn’t decide between the two juicy chocolate dessert choices, so they offered to bring me half portions of each. Now that’s a good idea! I had a half portion of dark and milk chocolate fondant terrine with praline leaf underneath and chicory cream and a half portion of a dense dark chocolate cake with a dark chocolate ganache, dark chocolate sorbet, infused with a perfume of some mysterious Tonga flat bean (Fève de tonka ) that was almost vanilla, but different, darker, richer, less sweet. I was offered a bean for inspection before making my dessert selection from a glass container full, and I slid it into my purse and kept it as a rather strange souvenir of the evening. My personally autographed menu Renee especially requested on my behalf is a rather more visually appealing souvenir — a million thanks to Renee for such a generous thank you gift from her, and for introducing me to this spectacular restaurant, and for sharing a wonderful evening. As we were staggering out the door with our Restaurant Guy Savoy bags containing our menus, the front desk staff tried to offer me a last morsel of sweets, which I tried to decline; but they slipped it into my bag. And since I didn’t get sick afterward, it was an especially delightful evening. I think I’ve experienced the best that Paris has to offer, with these Michelin three star experiences, and fear that I’ve been wrecked for lesser dining experiences — but I think I’ll keep eating.. I obviously fell out of the blog routine for the past couple of weeks. Brad was here for a week and we ate ourselves silly and now my Boulder friend, Renee Berberian, has been staying with me and we've been having too much fun to stay inside and blog. My supplementary class for speeding me along to catch up with the advanced class ended last Friday, so this week I've been back to what I originally signed on for, which is only 2 hours of class each afternoon from 1-3 at L'Ecole L'Etoile , and around an hour of homework -- so I've had time and energy to go fun places and see fun things with Renee and do some of the Parisian things that I've been too busy being a studious French student to do. I'll write about those experiences, too.. 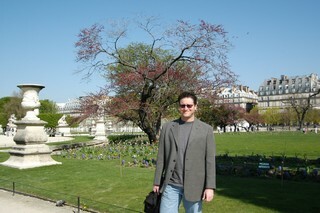 Here are photos of Brad dressed for his Parisian adventures with me, kindly carrying my camera bag. 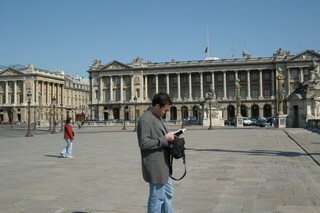 Although it looks like he’s consulting a guide book, I think he’s sneaking peeks at whatever book he’d rather be reading while waiting for me to finish take pictures of the Place de la Concorde. He's a very good sport. I miss him. One of the big reasons we moved from Boston to Boulder almost ten years ago was that I missed seeing the sun between the beginning of November and the end of April. Last week in Paris felt just like those long dreary months where it feels like it might rain any moment and you can’t really tell whether it’s 9 a.m. or 4 p.m. by the light in the sky because it’s just gray all the time. I was really lonely and felt like I was turning into one of those little old ladies who has 17 cats and no one to talk to. Go to school, come home and do homework, eat dinner, watch nearly incomprehensible French television and go to bed; every day the same thing. My big French grammar test was covered in red correction marks when I got it back, but after comparing results with the other students in my class I’m hanging right in with the gang. I think I’ve figured out pronouns and have had homework returned to me with hardly any red marks at all. Three of us moved from our intermediate class into the advanced class on Friday, and one woman decided to move down into an easier class rather than be stressed out all the time. I was definitely nervous before the new class on Friday, but it turns out to feel the same, or maybe even move a little slower, than the previous class. The new teacher told me that these students have bigger vocabularies; but aren’t as comfortable speaking the language. Lots of “book learning,” but not a lot of using French to actually communicate with other people. All of the students are Asian except one woman from Mexico. One of the students has a Vietnamese-French dictionary that must weigh 10 pounds that she brings with her to class. Our supplementary class in the mornings probably will end this week after we’ve adjusted to our new environment. I feel like I’m a fragile saltwater fish or something.. Speaking of fish, instead of April Fool’s Day here, they have Le poisson d’Avril (the fish of April) where people exchange little chocolate fish and play practical jokes and tape paper fish on the back of unsuspecting people. I brought some chocolate fish to class Thursday to celebrate our last day with our teacher and we had a nice happy moment for le poisson d’Avril. And the best thing of all is that Brad is here now. He landed Saturday morning and brought the sunshine with him. The weather was fantastic on Sunday and we walked around for three hours through the Tuilieries gardens and around the swanky neighborhood in the 8th arrondissement and back home along the river. I took some photos which I’ll post in the next day or so. It has gone back to being rainy and gray now; but I feel much less crazy and lonely.